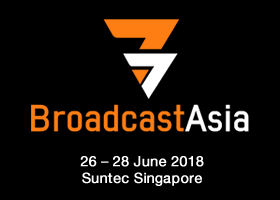 London, UK – 21 June 2018 – V-Nova a leading provider of video compression solutions, today announced that it will demonstrate its ability to make 4K distribution economically viable for broadcasters, operators and streaming service providers with the latest advances of its PERSEUS Plus codec at BroadcastAsia in Singapore (June 26-28). V-Nova’s solutions will be shown on booth 6K3-03. PERSEUS Plus on Multiple Screens: Streaming to a broad range of devices and side-by-side comparisons with other codecs like HEVC to illustrate significantly greater quality at up to 50% lower bitrates. Live 4K Primary Distribution: an end-to-end demonstration of live encoding and distribution of 50fps 4K/UHD at up to 70% lower bandwidth than other solutions in use today. The market penetration and affordability of UHD TVs is increasing rapidly. Today’s consumers want bigger, better and ultimately to view content in glorious 4K and the Asia Pacific region is projected to lead the trend for UHD service launches. Global online content providers are leading the way in 4K, but regional operators don’t have the scale to absorb the costs of launching 4K services with codecs that require new systems and hardware from the encoder all the way to devices. “PERSEUS Plus can cut 4K bitrates in half. Services like Netflix stream 4K VOD at over 15 Mbps and the few distributing live 4K content are using substantially higher rates than that, typically 25 – 35 Mbps. PERSEUS Plus simultaneously enables you to massively cut delivery costs while reaching millions more users. It absolutely transforms the viability of launching services today.” said Guido Meardi, CEO and co-founder at V-Nova. PERSEUS Plus works with industry-standard formats like MPEG-2 Transport Stream, HLS and MPEG-DASH to deliver the best picture quality across any platform, even at low bandwidths. Already supported natively by existing hardware without the need for plug-ins or OS support, PERSEUS Plus provides ground-breaking efficiency without increasing power consumption on devices. The PERSEUS technology works in 2 ways: PERSEUS Pro is an Intra codec for mathematically lossless and visually lossless professional production, contribution and imaging workflows. PERSEUS Plus is a temporal codec designed to enhance a base codec such as H.264 or HEVC, adding additional layers of detail and upscaling for unbeatable distribution efficiency to consumers.